Nobody likes to go on stage after a popular comedian. That's also true in the wine world. Georgetta Dane has never met Randall Grahm, but she meets his fans all the time. They're not aware that Grahm sold the Big House brand to the Wine Group in 2006, so when they learn she's the Big House winemaker now, they're disappointed. Some of Grahm's biggest supporters are wine writers who loved his knack for putting whimsy and romance into wines made from purchased grapes. "It's hard for me to be accepted by them," Dane says. Dane, a tall, confident food scientist from Romania, isn't likely to pen amusing back-label notes or a lengthy parody of Dante's The Divine Comedy. But her background is more interesting than Grahm, who went to UC Davis and has spent his whole career in the US. And she is no less outspoken. "Wine is easy to make," Dane says. "There's a lot of good technology. I studied sugar and my husband studied oil. Those are hard to make; they have awful technology. For me to learn wine was a piece of cake. Wine makes itself; winemakers take credit for it." But don't think she doesn't see the romance of wine. After Dane graduated from University of Galaţi in 1993 with a master's degree in food science, she had a choice of two jobs: at a large industrial winery, or a sausage factory. "I thought, there's no romance in sausage," she said. So she made huge quantities of ordinary table wine for two years. "It was one of those big Communist wineries," she said. "Their wines all tasted the same." Eventually she and her husband Corneliu, also a winemaker, started their own wine business, buying wines from around Romania and blending and bottling them under their own label. Georgetta also taught high-school chemistry to make ends meet. One night at a party, 10 friends decided on a whim to apply for the US green-card lottery. A few months later, Corneliu got the surprising news that he won. "We had a 1-month-old girl," Georgetta said. "The night we were baptizing her, we got the news that we won the lottery. I was afraid because we had a little kid. Neither of us spoke English, and we didn't know one person in the US. The compromise was that he came first. I came three months later." The Danes located a friend-of-a-friend of an English teacher in Romania who lived in Monterey, so Corneliu went there. Kendall-Jackson was building a new winery in the area and he got a job as a cellar rat. When she followed her husband, Georgetta was hired as a lab technician. Their English skills grew rapidly and their technical training was obvious. Corneliu became enologist within a year, while Georgetta switched to Golden State Vintners as an assistant winemaker. The Wine Group, America's second-largest domestic wine company, bought Golden State Vintners in 2004. The Wine Group doesn't get the press of E&J Gallo Winery or Constellation Brands, but it's a supermarket powerhouse with brands including Franzia, Inglenook, Fish Eye and Glen Ellen. In 2006, the Wine Group gobbled up Big House and Cardinal Zin. Grahm, who never disclosed the purchase price, was publicly relieved. Making 200,000 cases of Big House wine "stressed our resources and infrastructure to the max," Grahm said. He wanted to get smaller, and the press followed him. Meanwhile, Big House got bigger. Dane was put in charge as winemaker from the beginning and says she's now making more than 10 times as much wine as Grahm did five years ago. But at the beginning, the job was a shock. Big House was a kitchen-sink collection of grapes that didn't fit into any of Grahm's other labels. "One year before I was crushing 15 different grapes like any normal winemaker," she said. "When Big House was purchased we crushed 42 different grapes. We were crushing Teroldego, Charbono, Verdelho, I could go on and on. Randall had encouraged growers to plant obscure Italian grapes and we had contracts for all of them. I got overwhelmed. I had no history with the vineyards." "The idea to use all those varieties -- and that he brought them over from Italy -- that's what people fell in love with, more than the wine itself," she said. Forced to bring method to the madness, Dane made all 42 varieties into individual wines, which gave her lots to play with. "It was like I had all these essential oils, and I needed to make perfume," she said. "That became my philosophy. I make a base wine and I add the 'essential oils'." Her base for the Big House White was three aromatic grapes: Malvasia Bianca, Muscat and Viognier. "I tasted it and said, 'It's over the top'," she said. "It's perfume but it's cheap perfume. So I added Pinot Grigio and Gruner Veltliner for the middle note, to add some depth. The top note was Gewurztraminer for rose petals." 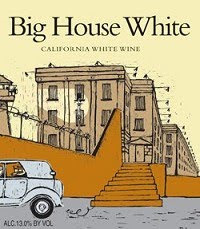 Big House White 2009 ($8) displays that aromatic philosophy. It's one of the most lovely-smelling white wines in this price range I've ever encountered: jasmine, white flowers, just a little fresh-tilled earth, and lichee. It's amazing to find a mass-produced wine this good: this is better than I remember it being under Grahm. Its stable-mate Big House Red ($8) isn't at the same level, but like all of Dane's wines it has juicy fruit flavors, restrained alcohol and no noticeable woody notes. Some wineries in this price range add teabags of oak chips to the tank to give their wines oak and vanilla flavors. Dane doesn't believe in that. "To me it's compromising," she said. "We have 20,000 barrels in our winery and 400 tanks. We are the largest small-lot winery in California." The Wine Group has expanded the Big House line, adding several 10,000-case varietal wines. The best is The Slammer Central Coast Syrah 2007 ($11), which entices with initial strong flavors of smoked meat that segue into juicy red plum. It's an excellent burger wine, as is the more straightforward The Prodigal Son Paso Robles Petite Sirah 2007 ($11). As part of its marketing, the Wine Group has nicknamed Dane "The Warden" of Big House. It's ironic because it brings to mind another job where popularity with the press isn't the surest sign of success. I have been a fan of the Big House wines for some time now--some years more than others. The recent ones I've tried have been good--and the white is a great blended wine. I appreciate your writing on this--it was both industry and consumer friendly. I will now keep this on hand for myself and guests! I've been drinking Big House off and on now for years and early on I found the reds to be hit or miss--sometimes the off-putting "bouquet" meant that the wine had to be "put-off" for a while until the miasma departed. Lately though, I have been impressed not only by the lack of miasma, but the overall quality and drinkability of this wine. While Randall had flair to spare (I loved reading not only his stories, but more so the stories about his wine-making methods), it's nice to know that the brand now has a solid, clear-thinking winemaker like Georgetta. P.S. I loved her perfume analogy. It was so fitting!